Dormancy in October? It is very dry and cool. I spent a couple days this past week teaching in a turf care training program at Central Park in NYC. 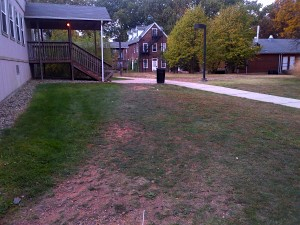 Lawn area entering the onset of dormancy. Shoot growth is shutting down and leaves are wilting. 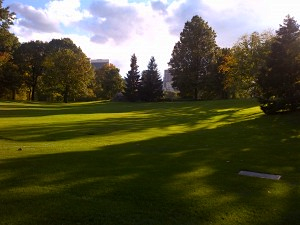 Many lawn areas in Central Park that are not irrigated were entering dormancy because of the dry soil conditions. And as you look around there is an increasing acreage of turf as well as shrubs and trees in our area that are being challenged by drying soil conditions. Fortunately, it is cool and many plants are tolerating the drying by entering dormant. However, managers should think about their end of the season programs related to irrigation shut down on high value turfs and other plantings. Make sure that you fully evaluate soil wetness/dryness before blowing out and shutting down the irrigation system. If the soil is very dry, it would be wise to irrigate to restore some soil wetness under your high value areas before shutting down the irrigation. Allowing soil dryness to extend into winter, should it continue to stay dry (little to no rain or snow cover), could set up those plants for desiccation injury during winter. Desiccation injury is relatively rare in our climate but the current conditions are a precursor for that possibility. Obvious high risk scenarios include sand-based putting greens and plantings grown on the very sandy soils of the coastal plains of NJ that have been allowed to dry down during October. Below: Central Park provides some beautiful landscapes within the very urban setting of Manhattan. 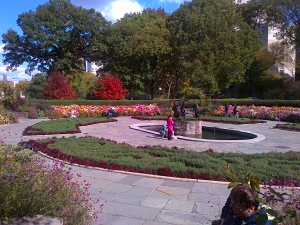 The Conservatory Garden is one of the formal gardens at Central Park. Frisbee Hill in Central Park. Conservatory Garden at Central Park.